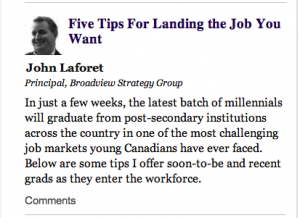 Broadview’s Principal, John Laforet, wrote a column for Huffington Post Canada with tips for job seekers, and particularly those that will soon be graduating from post-secondary education and entering the workforce. Anyone trying to find work (and particularly the “right” work) in today’s job market will find his practical advice to be very helpful! In just a few weeks, the latest batch of millennials will graduate from post-secondary institutions across the country in one of the most challenging job markets young Canadians have ever faced. As of January 2013, Canada’s youth unemployment rate is 13.5 per cent and that means greater competition for what jobs are available for young professionals. From an employer’s perspective, narrowing down a massive pool of resumes to a few candidates is equally challenging, as a higher overall unemployment rate has resulted in applicants who would normally be considered ‘over-qualified’ applying for more entry level positions and demonstrating a good mix of experience and passion for the work. Below are some tips I offer soon-to-be and recent grads as they enter the workforce. They highlight the best practices of those who have hit me up for employment at my firm. You can read the full article over at The Huffington Post.